A hospital’s intranet is typically viewed as the internal hub or portal that allows all hospital staff access to house wide or departmental policies and procedures and other relevant content they need to perform their daily jobs. When a hospital is first implementing an intranet – whether it is a rural critical access hospital or a metropolitan healthcare system – our clients often ask us for other non-traditional ideas for content that can by published on intranet pages. 1. 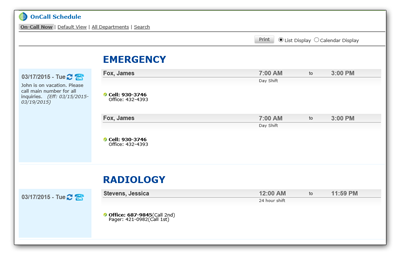 A searchable phone directory of hospital staff and departments available to all staff. 2. A secure and searchable directory of direct contact numbers for staff accessible to dispatch operators and emergency response team that can be used in emergency situations. 3. Direct single sign on (SSO) links to secure 3rd party websites (such as medical libraries, MSDS sheets, etc.) eliminating a needs for generic password distribution. 6. Hospital employee wellness initiatives and program information page including wellness education, relevant YouTube videos, wellness calendar, BMI calculator, wellness tip of the day, a recipe book, etc.). 8. Patient safety suggestion form – an online form that allows staff to anonymously submit patient safety improvement initiatives. 9. Key hospital admission statistic or occupancy rates – automatically updated regularly and displayed right on the home page. 10. A searchable roster of affiliated physicians that includes specialties, languages spoken, NPI numbers as well as other information that may be relevant to the hospital (such as internal staff no, or maybe even glove size…). 11. New employee onboarding page containing relevant policies, procedures, and instructions – a one stop shop for new staff. 12. New employee profile highlight/welcome page including a photo and short introduction. 13. Employee of the month or year wall – a virtual “hall of fame” with a hyperlink to an on line employee of the month nomination form. 14. Staff stories – a listing of articles submitted by staff with a hyperlink to a staff story submission page. 15. Patient stories – a section that displays selected patient stories and articles. 17. “Ask the geek” forum – a forum moderated by IT for staff to seek advice about technology – to be most effective, the forum should allow for asking non-work related questions as well (i.e. how do I set up a Wi-Fi at home, what are best options for controlling pages my kids can access, etc.). 18. Ask the leader/CEO form – a form for staff to directly submit questions to the leadership team. 19. Benefits forum – a forum moderated by HR where staff can openly ask benefits related questions thus eliminating the need for direct phone calls or HR visits. 20. Idea Bank – a place for staff to submit performance improvement ideas and track implementation / progress in an open, transparent way. 21. An online facilities department work order request form. 22. Read and Sign – a designated spot where staff can access relevant policies or procedure updates and confirm they read them with a reporting mechanism for management team. 23. Hospital Emergency Codes – a color coded list of emergency codes with quick links to relevant procedures or quick action sheets. 24. A Hospital Board Members Page – a designated and secured page for hospital board members to access meeting minutes and meeting packets and meeting calendars. 25. Internal Job posting / career section – a list of internal or public job openings at the hospital. 26. A Meeting Room Calendar – a calendar view of meeting rooms and booking requests. 27. Scrollable Alerts – a stock ticker like display of alerts, system down notifications, emergencies etc. 28. Weather widget or Traffic widget – inclusion of 3rd party widgets to display local information such as weather or traffic. 29. Contracts Repository – a secure section hosting relevant contracts (such as physician contracts, hospital contracts, department specific contracts, etc.). 31. Internal Class Listings – a listing of internal classes and training opportunities for hospital staff. Can be used for general employee education or project specific classes (i.e. EMR implementation classes for physicians and nursing staff). 35. Ride sharing / carpooling forum – an open forum where employees can inquire about and post ride sharing and carpooling announcements. Feel free to schedule a demo and review these and other ideas for your Intranet implementation.